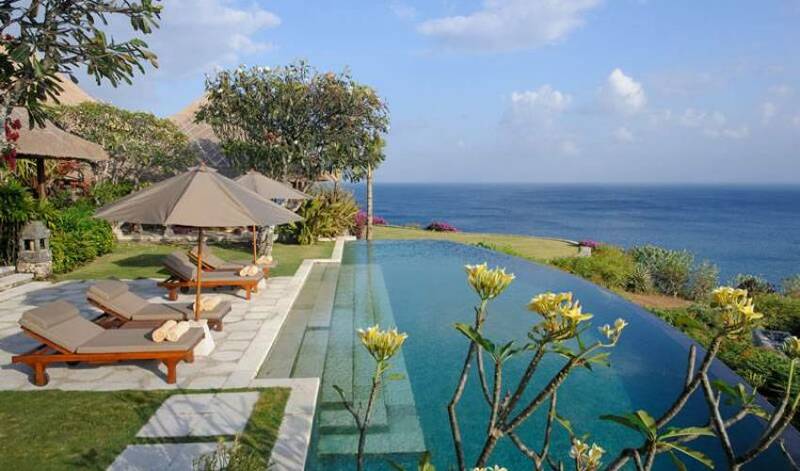 This elegant, classic Balinese villa, which includes a self-contained two-bedroom guesthouse, is fully staffed and boasts exceptional facilities, including two pools, a gym, a tennis court and a children’s play area. The villa is an ideal choice for families and groups alike, but the villa really comes into its own as a magical and unforgettable wedding venue. 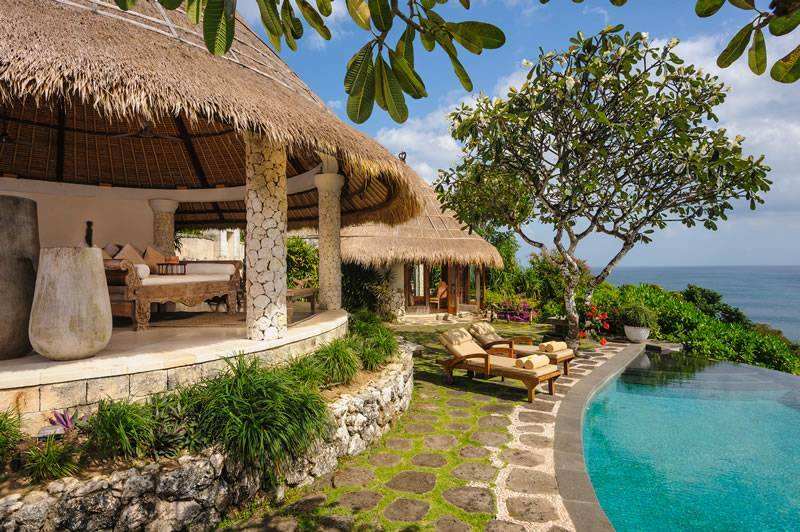 Designed to merge perfectly with its dramatic coastal setting, the magnificent five-bedroom the villa employs a delightful mix of limestone, teakwood and alang-alang thatch, blending traditional architecture and antique elements. 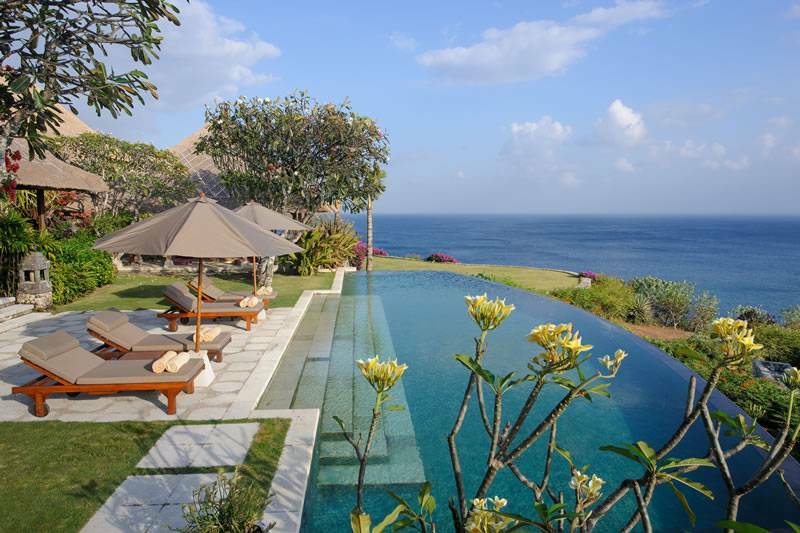 The main three-bedroomed villa and a two-bedroomed guesthouse, each with its own swimming pool, laze luxuriously amongst the tropical cliff-top gardens creating a holiday villa with style and personality. 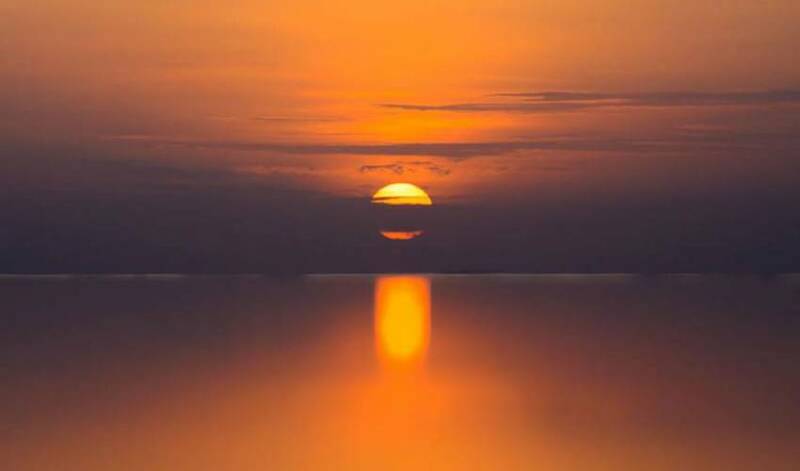 This villa was one of the first properties to be built along this spectacular, arid coast, and ten years on the maturity of the villa is one of its greatest assets. With its meticulously manicured lawns interspersed with ancient, gnarled frangipani trees and brilliant bougainvillaea blooms, the villa boasts a patina that comes with time, creating an elegance that most modern villas cannot match. 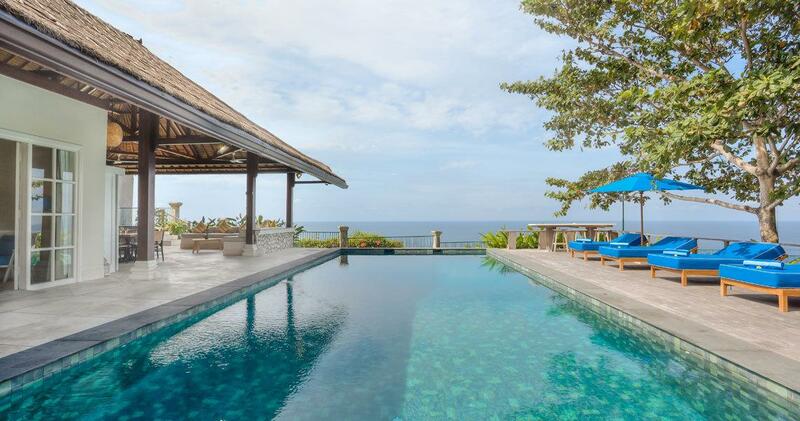 Neither can many hold a candle to the villa’s luxurious three acres of land. They just don’t build villas on this kind of scale any more. 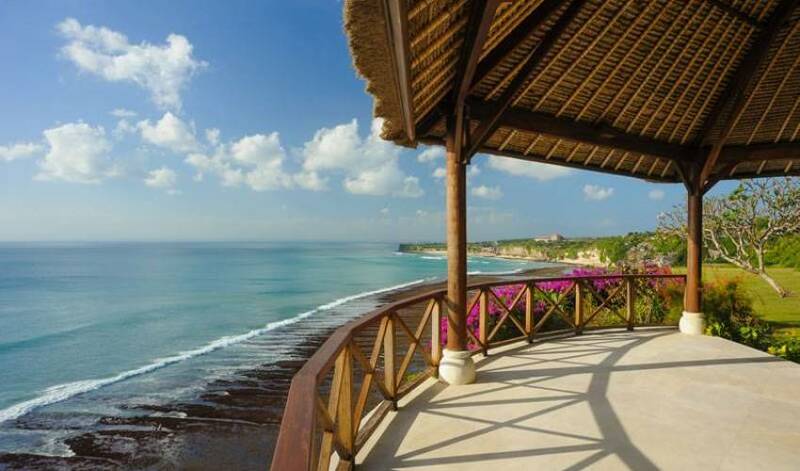 The villa’s friendly staff team, which includes a manager and a chef who can both boast five-star hotel experience, will entice your taste buds and take care of your every holiday need. With its impressive range of facilities and space enough for all, the villa is perfect for family holidays and entertaining friends, while its extraordinary backdrop, with island and ocean views stretching from north to south, and specially designed function lawns make the villa the ultimate tropical wedding venue. The villa’s main living pavilion lies at the centre of the property and is dominated by large wooden sofas topped with deep cushions in muted fabrics to match the tone of the house. An antique Chinese cabinet houses the entertainment system and the room is ornamented with some delightful art and sculptures. 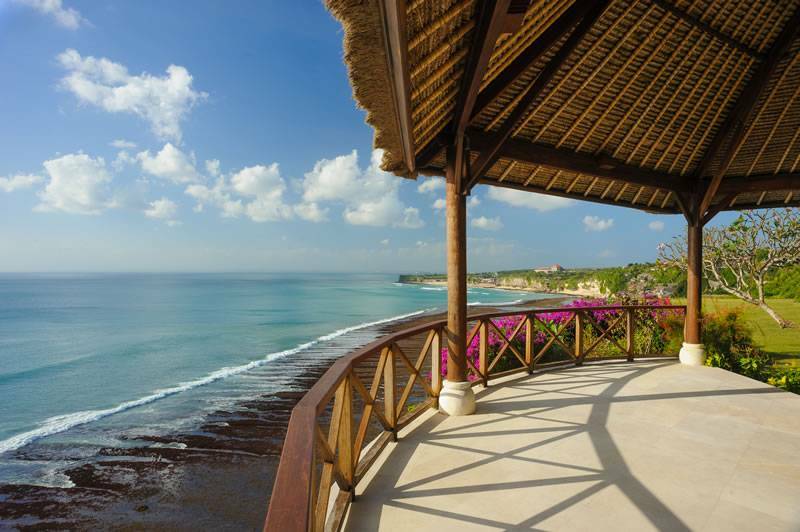 To the right is the dining pavilion, furnished with a square table and 12 chairs, and with a spacious ocean-view terrace. Some more intimately sized tables and chairs make this the perfect spot to enjoy afternoon tea, evening cocktails or a casual dinner under the stars. A large gourmet kitchen is located behind the dining pavilion and the staff will fill the fridge according to guest’s shopping lists. Guests can help themselves to snacks from here, or cook up a storm should they feel so inclined, or simply leave it all to the accomplished chef. In another building, reached by a covered wooden walkway from the sleeping pavilion of the main villa, is a study with an impressive antique desk, bookcases, dedicated internet connection and comfortable furnishings. This upstairs room, also offering sweeping views, is a perfect hideaway to catch up on messages and work quietly. Downstairs, a comfortable TV room also opens to the view. Air-conditioned and furnished with a deeply cushioned white sofa and a wall lined with bookcases, this room can be converted into an extra bedroom for children, with two single beds, and has a guest toilet. 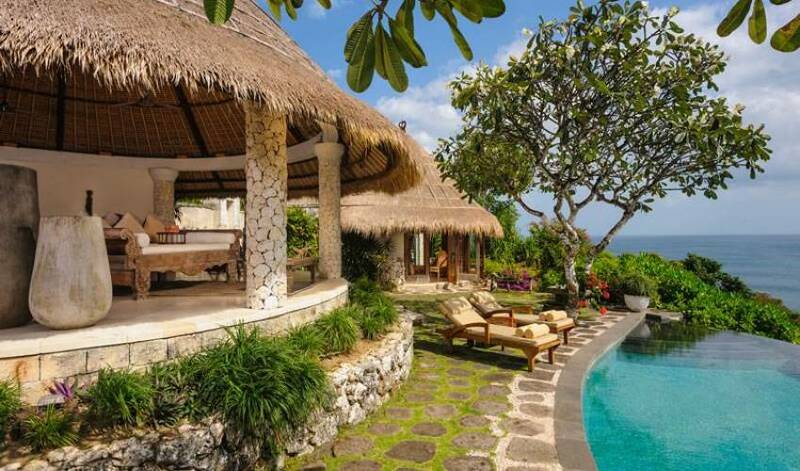 A large thatch-roofed Balinese wantilan, set in the gardens beside the main pool, is furnished with low, cushioned sofas. This is the ultimate relaxation area and also perfect for yoga or massage. Ceiling fans and Bose speakers enhance the ambience. 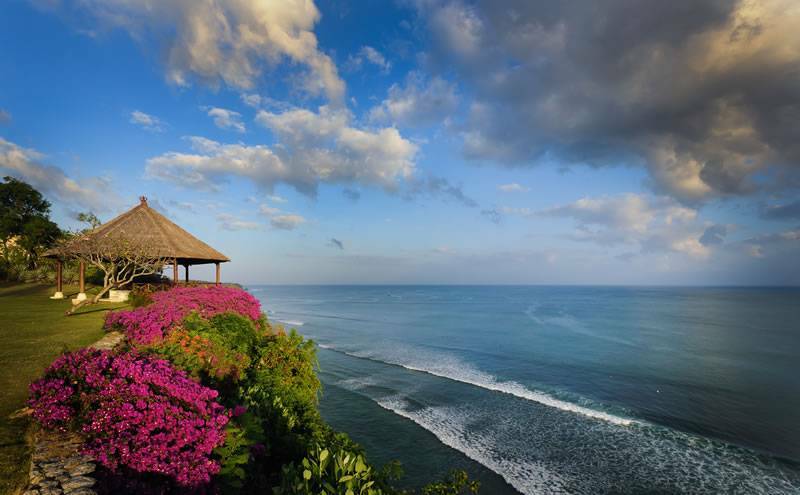 A romantic balé lies at the far edge of the property looking towards Uluwatu and the setting sun. Put to great use during the many weddings celebrated at the villa, the sunset balé has a stone floor and thatch roof to blend with the style of the house. Next to the gym is a children’s play area with a large sandpit and swings. Parents wanting to keep fit can keep an eye on their kids at the same time. The estate also has a full-size outdoor tennis court. Floodlit for night games, the court is another fantastic addition to the villa estate. 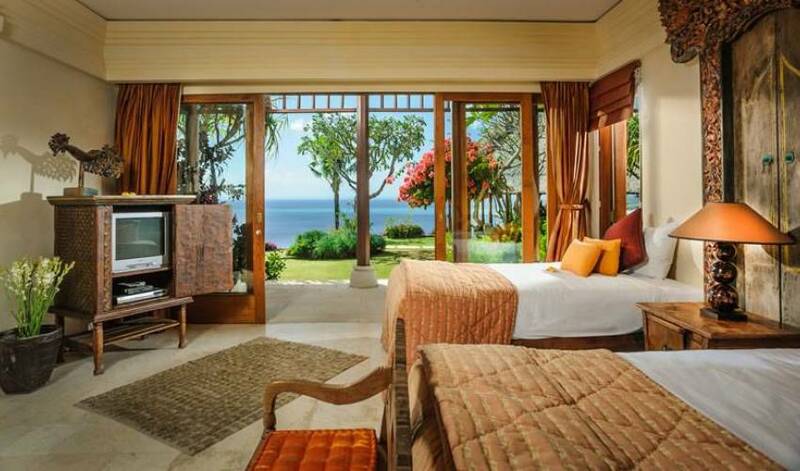 The villa’s master suite occupies the entire second floor of one pavilion. 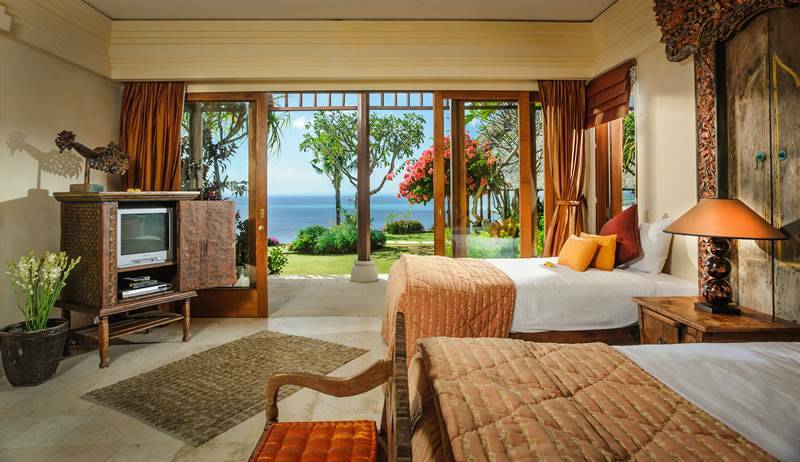 With a wide wooden veranda that runs the length of the suite, large teak and glass doors open to the views beyond. A super-king, four-poster bed dominates the room and a comfortable sofa and a desk complete the furnishings. The two-bedroom guesthouse has its own entrance and parking area and is linked to the main villa by a limestone walkway. Featuring conical thatched roofs, bleached wood furnishings and tribal art, this building has a relaxed beach-house feel. The living room overlooks the second pool and has yet more breathtaking views. A guest bathroom and a small but self-contained kitchen, equipped with a full-sized fridge, a wall oven and tea and coffee making facilities, are attached. 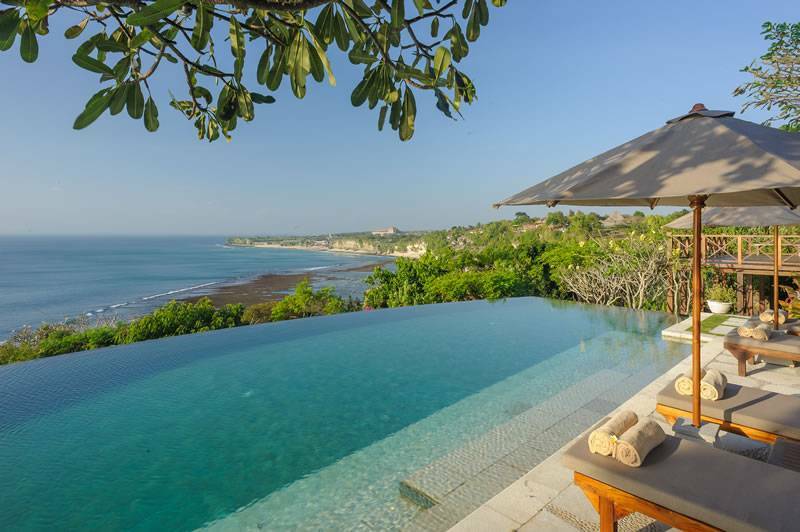 The villa shares its magnificent 180-degree views with a sprinkling of other private luxury villas and lavish hotels on Bali’s trendy Bukit Peninsula. Guests can wander down to Bingin beach from a pathway just beyond the villa’s gates, and even as far as Dreamlands beach at low tide. Padang Padang, another popular surfing spot, with more facilities and easier access, is just under two kilometres from the villa back down the main road. 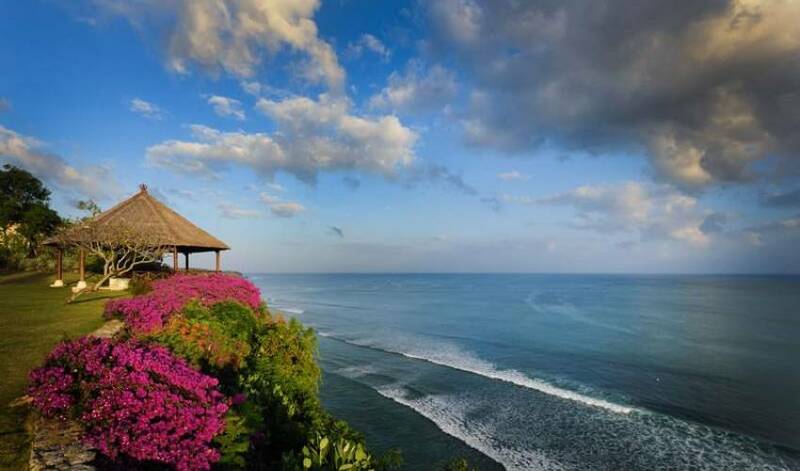 The famed Uluwatu Temple – a mecca at sunset – is a twenty-minute drive away. If guests want to eat out, there are many five-star resort restaurants within a few kilometres, including the Anantara resort, which is almost next door. We had a fantastic time at the villa. The staff were lovely; but mainly I am so pleased I went with my gut instinct and chose this beautiful place.